WARNING: Baghdad remains too dangerous for leisure travel. Those who are travelling here on business are strongly advised to consult their own government first and look closely at security requirements. The British Foreign and Commonwealth Office advises against all but essential travel to Baghdad. Baghdad (Arabic: بـغداد Baġdād) is the capital of Iraq. Once one of the greatest centres of learning and culture in the world, Baghdad has a long and illustrious history. Once a favoured destination on the 'hippie trail' and packed full of sights, since the American-led invasion of 2003, Baghdad has since become one of the most dangerous cities on earth. Travel to Baghdad is not recommended (Sep 2018) because of wartime instability and security concerns. Westerners are particular targets of kidnapping and assassination by militant and extremist groups. Baghdad airport is secure, so transiting there if necessary is safe. 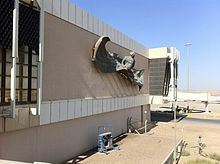 A flying carpet sculpture on the wall at Baghdad International Airport. (previously Saddam International Airport) BGW IATA is about 16 km west from the centre of Baghdad. After some damage during the wars, the airport is in full operation and growing due to the recovery of Iraq. All of the usual airport facilities are available, such as banks, money exchange, ATMs, mobile phone companies, restaurants and even a hotel. The airport has three interlinked terminals, one of which is being refurbished. It is easy to walk between the terminals both land side and air side. One terminal is used by Iraqi Airways (the most counter-clockwise one) and the middle one handles all other flights. The food outlets are small and limited air side, so if you have a long wait, it is better to check in and return back through security to use the land side restaurants. The national airline is Iraqi Airways that operates a growing fleet of more than 30 modern jets. Their main activity are domestic flights but Iraqi Airways also offers flights to numerous international destinations. FlyBaghdad also has local and regional flights to/from BIAP. The best way from Europe to Baghdad is either with Austrian or Turkish Airlines. Austrian Airlines provides four flights per week from Vienna (VIE IATA) to BIAP. Turkish Airlines flies twice daily from Istanbul (IST IATA) to BIAP. Within the Middle East, Royal Jordanian Airlines operates two daily roundtrip flights from Amman(AMM IATA). Emirates and the low-cost carrier flydubai from Dubai arrive on a daily basis in Baghdad and Basra. Baghdad airport is under control of the Iraqi government. Take-offs and landings at BIAP are controlled by the Iraqi Ministry of Transportation. Several critical pieces of Air Traffic Control gear have not been turned on, and the result of this is that BIAP can only accommodate Visual Flight Rule (VFR) landings, not instrument landings. Because of this, the frequent sandstorms that hit the area can obscure visibility and cause flights to be turned away. It is not unusual for commercial flights to make it all the way to BIAP, and then turn around and return to their origin due to limited visibility on the runway. When departing at BIAP, be prepared for some queuing. If you are not working in Iraq on a government contract, your entrance to the airport grounds about three or four miles from the airport terminal will require you and your vehicle to wait in line to be searched. These security checkpoints can take from two to three hours to process through. The best strategy is to find accommodations somewhere within the BIAP area of control on the day prior to your flight so that you aren't subjected to the long wait and end up missing your flight. Nightly train services are available from Basra, arriving early morning. Prices range between IQD 10,000 for a couchette to IQD 25,000 for first-class. Irregular services from Karbala, mostly on weekends, are available too. Additionally, trains runs twice per day from Fallujah. Due to the ongoing conflict cancellations are common. 33.32376444.3805952 Baghdad Central Station (محطة بغداد المركزية), Damascus Sq. Completed in 1953, Baghdad Central Station is an architecturally impressive terminus, all trains call here. Located on Qahira Street, a kilometre north of city centre, at Damascus Square. Overland travel is possible from all neighbouring countries, but is strongly discouraged due to violence. Multiple daily buses arrive from most major Iraqi cities. The Jordanian state bus company, JETT offers two weekly bus departures from Amman, leaving at 07:00. A one-way journey costs 42.50 Jordanian dinars. Long-distance bus services from Istanbul and Ankara restarted in the summer of 2018, with two departures per week. However journey time is a gruelling 30 hours or more. Most long-distance buses arrive at the sprawling 33.3245844.3844773 Al-Alawi bus terminal (گراج العلاوي), next to the central station. Buses leave and arrive from stands both north and south of the Allawi skyway. Traveling around Baghdad is dangerous due to almost daily bombings and shootings. Those that can afford it use helicopter or armored cars. The International Zone around government buildings and the embassy area is safer and it is possible to walk or use a bicycle, even here however it is always important to be vigilant. Baghdad is served by an extensive bus network, maps of the network is however not available in English. A commuter service connects the city with the southern suburb of Doura. Taxis are also plentiful and quite cheap to use. 33.31467244.3732082 Baghdad Zoo (حديقة حيوانات بغداد). The largest zoo in the country, opened in 1971. It was destroyed in the 2003 war but has quickly recovered. There are, however, few larger mammals to see. 33.34022744.3897743 Baghdadi Museum (المتحف البغدادي) (Eastern bank of Tigris, 200 metres from Shuhada bridge.). History and folklore museum depicting life in Baghdad. 33.30555644.3830564 Swords of Qādisīyah (قوس النصر) (Inside the Green Zone). A huge pair of triumphal arches celebrating the alleged victory over Iran. Also known as the Hands of Victory. It marks the entrances to a former parade ground. 33.30855644.3891675 Monument to the Unknown Soldier (صرح الجندي المجهول). Inspired by the glorification of a martyr from the Iran–Iraq War. The monument represents a traditional shield (dira¹a) dropping from the dying grasp of an Iraqi warrior. The monument used to house a museum which is now mostly empty. Ask the Iraqi soldiers who guard the monument for permission. 33.34333344.4461116 Al-Shaheed Monument (نُصب الشهيد) (East side of the Tigris river, near the Army Canal). Another monument dedicated to the Iraqi soldiers who died in the Iran-Iraq war. The monument consists of a circular platform 190 metres in diameter in the centre of an artificial lake. A museum, library, cafeteria, lecture hall, and exhibition gallery are on two levels underneath the domes. 33.32833344.3858337 National Museum of Iraq (المتحف العراقي). Covering the history of Mesopotamian culture, this museum housed a huge collection before the Iraq War. Today, many pieces have been looted and the museum is open only on special occasions. 33.33777844.2963898 Umm al-Qura Mosque (جامع أم القرى). A mosque built to commemorate the "victory" in the 1991 Gulf War, the minarets are shaped like barrels of guns and SCUD missiles. 33.3844.3381399 Al-Kadhimiya Mosque (الحضرة الكاظمية) (Northwest of Baghdad). One of the most important Shi'ite religious sites in Iraq. It was finished in 1515 and the 7th Musa ibn Jafar al-Kathim and the 9th Imams Mohammed Al-Jawad were buried there. WARNING: Employment arrangements are always made in your home country. Do not come to Iraq on your own to look for work. People have been killed attempting this! There are several ways to work in Iraq as a foreigner. For US citizens the most obvious is the US Army which still maintains personnel here. Next are the government contractors, such as the construction company KBR . Many contractors hire personnel with prior military experience to return to Iraq. Persons with military experience or who are fluent in Arabic are especially sought after. Lastly, there are civilian government agencies in Iraq. USAID and the US Department of State send their own personnel as well as contractors to Iraq. The agencies above are all relevant for US citizens. Citizens of other countries with a presence in Iraq can apply for work through the respective agencies in their home country. Rugs and DVDs are available to buy. Inspect the quality of rugs carefully: Some are cheap Chinese-made rugs, and many are extremely overpriced. Also, many DVDs, especially those from street vendors, are bootlegs of varying quality. Restaurants and cafés are notorious targets for suicide bombers, making eating out a quite dangerous activity. However, safety is much better among the restaurants inside the Green Zone. The zone is also the place for finding American fast-food in the Middle East including Burger King, McDonald's, and Subway. Bob Hope Burger Bar (At Baghdad International Airport), ☎ +964 7903852457. One of the few American-style restaurants outside the Green Zone. Marsa Al-Zawariq (On Abu Nuwas St), ☎ +964 5373228. A place famous for its kebab grills. Iraqi tea served at Shah Bender Café. Many international organisations have their own bars, and some are open to all. While bars outside hotels are scarce, tea houses and cafés are plentiful. Most organizations arrange their own accommodation inside the Green Zone. Sleeping in hotels in the proper city is always a risky due to bombings. Baghdad International Airport Hotel (فندق مطار بغداد الدولي). A standard business hotel, but with quite a hefty price. On secure grounds at the airport and often used by people visiting on business. USD225 for a standard room, lower rates when staying longer. 33.29119544.3902522 Babylon Warwick Hotel, Karrada Street, ☎ +964 7 505 223 333. 33.31387144.4188664 Cristal Grand Ishtar Hotel, Saadoun St, ☎ +964 770 6770711. A hotel in central Baghdad. USD50+. The easiest way to stay safe in Baghdad is not to go there in the first place, except for official reasons. Movement within Baghdad is difficult and entry into the International Zone, aka Green Zone, requires a pass or that you be accompanied by authorized officials. Iraq is a war zone and even if you're from a country which is part of the coalition, you will not be granted entry into the IZ without authorization. Most expats and business travellers to Iraq hire a security detail which constantly monitors the security situation within Iraq and around Baghdad. Travel outside the IZ is extremely dangerous. Roadside and car bombs are detonated every day in Baghdad. Many Iraqis are armed. Markets and popular gathering places are frequent targets of bombers. As a foreigner you are more likely to be targeted for kidnapping. Kidnappings are often financially motivated. These threats are not restricted to Americans or women. You are also likely to be refused access to accommodation as Iraqis will fear being targeted for supporting the occupying forces. Canada, British Embassy Compound, International Zone, ☎ +964 782 783 5084, e-mail: BGHDD.Consular@international.gc.ca. Greece, Hay Babil, AL-Jadriyah Sector 913, Rd. 31/ Built 63, ☎ +9641 778 2273, +964 790 364 2046 (Emergencies), fax: +870-763262272, e-mail: gremb.bag@mfa.gr. Serbia, Jadriya Babil District Mahala 923, ZUKAK 35, Bldg 16, ☎ +964 1 778-78-87, fax: +964 1 778-04-89. United Kingdom, International Zone, ☎ +44 1908 516666, e-mail: Baghdad.consularenquiries@fco.gov.uk. United States, Al-Kindi St, International Zone. Su-Th, 08:00-16:30. This city travel guide to Baghdad is a usable article. It has information on how to get there and on restaurants and hotels. An adventurous person could use this article, but please feel free to improve it by editing the page.